Yum! 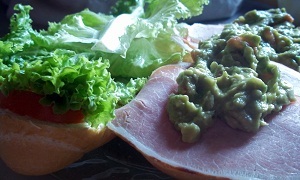 Guacamole, the fast, healthy, cheap, delicious and versatile hostel food. Guacamole can be eaten with tortillas, bread or crackers. Or spread on any sandwich to add taste-bud bursting flavor. Guacamole does not keep very well so you should eat it right away, which never is a problem. 1) Cut avocado in half length wise and spoon avocado into bowl. 2) Mash avocado and then add diced onions, garlic, and salt. 3) Add optional ingredients: tomoato, chile and cilantro. 4) Add juice from lime. This will help stop the avocado from browning. I prefer to use the pebbly skinned Hass avocados. These have a lot more flavor then the large avocados found throughout south america.